I know, I know, laksa should not have chicken. Prawns, cockles and all that is so not my bag. So I have reverted to have a couple of prawns, and chicken for the main meat elements. This is my Chicken Laksa Recipe, as an alternative to the rather fishy version you are likely to consume in the hawkers and coffee shops. Have a go at something different. This will feed about 6 people. Yes there is a slight cheat, but it’s just to create the base. My chicken laksa. 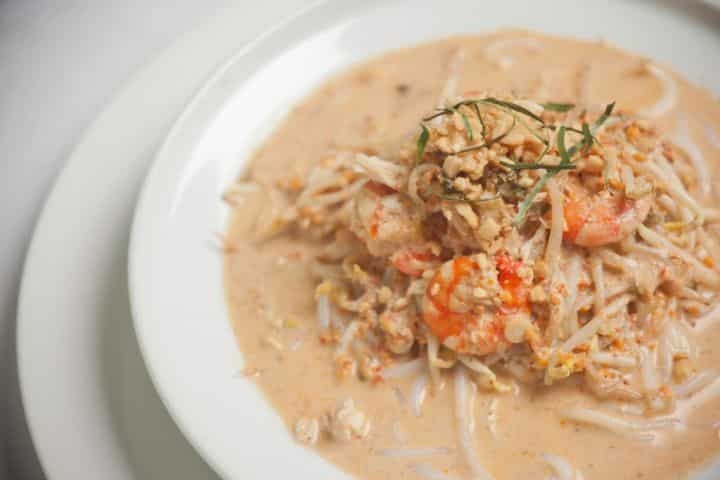 I know very very naughty, it breaks all the local rules of laksa, but who cares it is my version and I am sticking by it! 1″ knob of chopped yellow ginger or galangal. When the prawns and chicken are cooked your soup is done and you are ready to serve. When plating this up, split the prawns and chicken in to equal amounts. Ladle on the broth and sprinkle with the mint, a little finely sliced kaffir lime leaf and a squeeze of the remaining lime juice. That’s it food lovers, get this down your neck. Absolutely delicious. My Chicken Laksa Recipe. It’s bloody good. If you want to go all authentic-like though go here, to 328 Katong Laksa. This is the original opposite Rabbit Carrot Gun Pub, and what was Paramount back in the day. They have also opened a new one up from I12 now – almost an overflow. 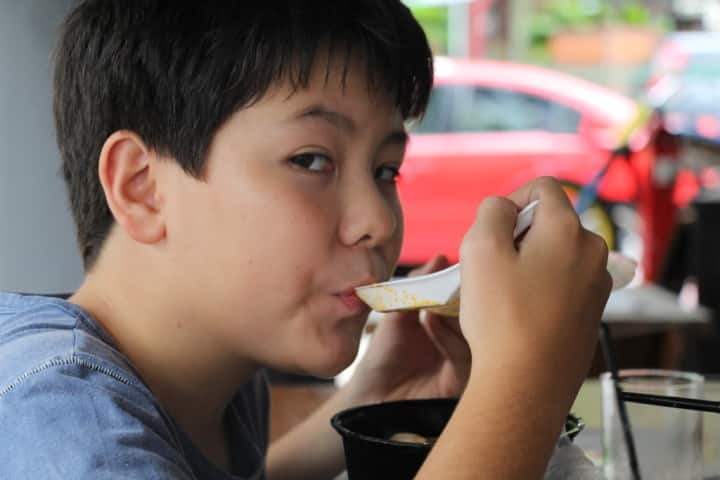 Face says it all – Mr Kennett slurping to hearts content. Sorry to say this is just too fishy for me. Cockles and all that, not my cup of tea, or Laksa come to that. 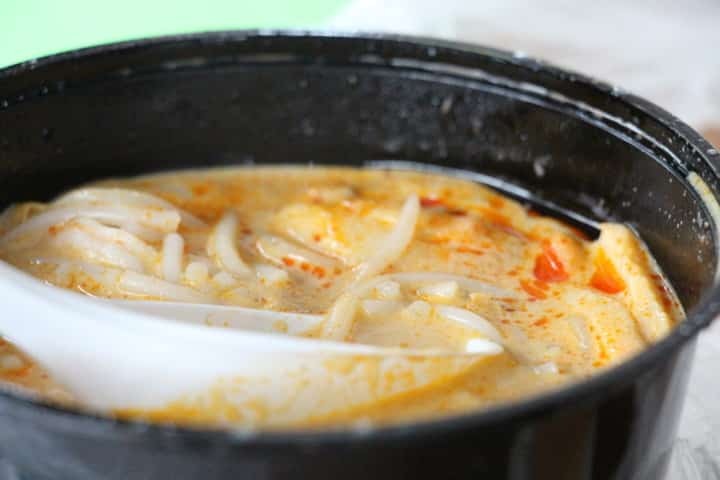 Here it is in it’s little take-way bowl – the Singaporean famous laksa from Katong. I could watch these guys prepare this for hours. Pour in, drain, pour in drain, then pour in one more final time – incredible. But please please try my version and my Chicken Laksa Recipe. I think it is unique. Never have I seen as a recipe for chicken Laksa. For those not in love with cockles this is your bag. It is seriously bloody good. Packet spice on steroids. Just try, I know you will love it, and if you do try – ENJOY!!! 2 Replies to "Chicken Laksa Recipe"
Pad Thai chilies? Or chili padi. You can also cheat by using store-bought sambal as a condiment. Nothing wrong with chicken laksa. Chili spelling corrected my friend ha ha. I was kind of thinking of the true to origins eaters of fare matey – you and I both like to push the boundaries of the original. Now what would Dr Leslie say from I Eat I Shoot I Post? Ha Ha!!! How many woks we he give this?? ?